Our product is enriched with anticorrosive ingredients and does not drip after the treatment. The product forms a protective gel by creating a barrier against moisture which contributes to rust development. It penetrates the smallest corners of the metal for complete and solid protection. Since 1976, our product has undergone several studies to make it better. To provide maximum protection for your vehicle, rust proofing must be performed once every year. Also, the quality of the application is just as important as the product itself. Every area that needs protection must be treated using the best tools and techniques. Over the course of its many years of experience, Metropolitan Rust Proofing has developed solid expertise in its treatment application techniques. All this thanks to some 200 employees who put together their knowledge and experience through our Operations department. This department strives year after year to optimize our application techniques according to every vehicle model’s specific needs. This results in «state-of-the-art tools», like our unique drilling manual which holds every vehicle make, model and year with specific areas to drill holes to be able to properly inject our product. The rust proofing product application time takes between 35 to 45 minutes. In times of high production, this time can be reduced by the number of employees working simultaneously on your vehicle. During winter, it takes approximately an hour to allow us to de-ice and dry your vehicle. A visual inspection of the vehicle is completed and the access points are created in strategic locations. We affix a treatment sticker of the current year certifying that the vehicle is protected. 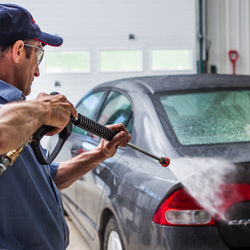 In case of rain or snow, industrial dryers are used to dry the vehicle before the product is applied. This will improve the infiltration of our antirust product. Pressure spray guns are used to ensure uniform application of the product and in order to protect hard-to-reach areas. Exterior wash to remove any oil residue. 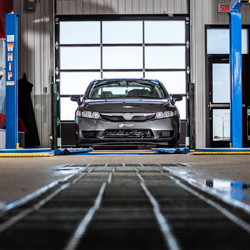 After a brief inspection of your vehicle, we offer certain recommendations and warnings before you leave. A visual inspection of the vehicle is completed and the access points are created in strategic locations. We affix a treatment sticker of the current year certifying that the vehicle is protected. 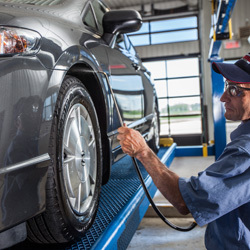 In case of rain or snow, industrial dryers are used to dry the vehicle before the product is applied. This will improve the infiltration of our antirust product. Pressure spray guns are used to ensure uniform application of the product and in order to protect hard-to-reach areas. The exterior of the vehicle is hand washed. 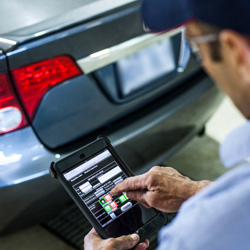 After a brief inspection of your vehicle, we offer certain recommendations and warnings before you leave. 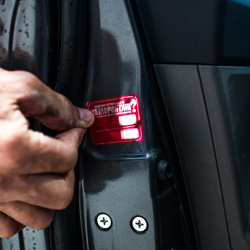 Our technicians drill access points in strategic locations (bottom of doors, rocker panels and rear fenders) only during the first treatment. These access points allow us to introduce the product to reach and protect hard-to-reach areas. Thus, we prevent rust from developing in enclosed areas. After the treatment, each access point is coated with our rust protection, then covered with a black plug. 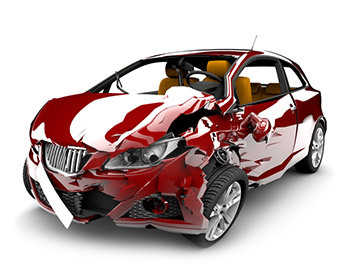 If you have an accident with your vehicle in the year following one of our treatments, we will treat the damaged parts again for free. It is important to wax your vehicle once or twice a year and wash it regularly. Protect your vehicle every year and make paint touch-ups when needed. In winter, during mild weather, remove snow and salt build-up around fenders. Pay attention to the rear spoiler, the vibration of the spoiler may cause friction and lead to paint chipping, and corrosion in the long run. Repair any damage immediately and install gasket if needed. Tires may be slippery for a few kilometres. For a short period of time, you might experience some smoke along with an odour of heated oil coming from the exhaust system. Also, if you need to open your trunk or hood, be careful, product may ooze a little. For rust to form, three things are needed: iron contained in metal, water and oxygen from the air. While oxygen is always present, steel does not rust when the air is dry. If steel sheds water quickly, the corrosion doesn’t have time to form, but if metal retains moisture, it rusts. In addition, when steel is subjected to physical stress, such as sudden temperature changes, vibrations, etc., vulnerable areas can form that make iron more likely to rust. No. It begins as a microscopic form that is not visible to the naked eye. When it appears it is too late to act. Also, don’t forget about all the hidden areas of your car where rust can develop without you knowing: door panels and hood, rear fenders, frame, uprights and rocker panels. For these reasons, it is important to treat your car once a year to prevent rust from forming. What are the main factors that contribute to rust? Air pollution and acid rain are very corrosive. As well, our air contains many more gases than it did 50 years ago, like sulfur dioxide and nitrogen oxide. This is why our cars rust more than our grandparents’ vehicles did. Sudden temperature changes, especially when cool or cold weather becomes warm and humid. Actually, heat expands metal, which then allows the ambient or projected humidity to embed itself more easily into steel pores. Contrary to popular belief, metal rusts in hot weather, not in winter. However, winter prepares the ground for the forming of vehicle corrosion with snow, mud, salt and calcium, and especially when wheels throw these materials violently at the undercarriages of cars and trucks. How and where does rust attack a vehicle and why should it be treated with rust proofing every year? The assembly of a car or truck promotes the formation of rust. While it’s assembled, the parts of a vehicle suffer no less than 1500 folds and rivet points. 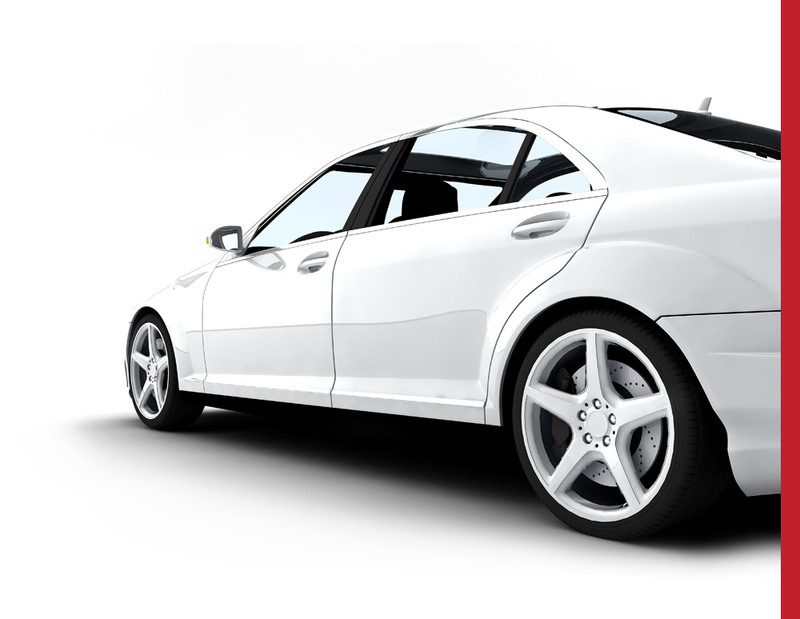 This shaping damages the vehicle’s original rust proofing, which leads to the formation of rust. In addition, to offer their vehicles at a lower cost, manufacturers often use cheaper alloys that are lighter, but also more vulnerable to rust. For these reasons, if you have just purchased a new vehicle we recommend that it be treated immediately , even if the manufacturer guarantees it against rust. The corrosion will have no chance to settle, and you will benefit from our lifetime warranty against rust. A car has many concealed corners...where moisture still manages to settle! For example, this is true of the inside of doors or the hood, where water gets trapped without being able to evaporate. Fortunately, Metropolitan Rust Proofing treats these fragile areas and all others, like the rear fender, the doors and rocker panels. During winter, the undercarriages of cars are frequently subjected to harsh attacks from sand, salt and calcium being thrown by the wheels. In addition to being rust accelerants, these materials can even damage the best rust proofing, even yours. Because of the climate we live in, it is important to treat your car once a year. Why should I treat my car once a year? Our climate is so harsh that most rust proofing products lose their effectiveness over time. The salt and calcium dumped on roads during winter, as well as sand and dust can damage the protective anticorrosion coating, which eventually leave certain parts of the vehicle unprotected. Should I protect my new vehicle against rust? Yes, as soon as possible. This will prevent the corrossion process from starting. I have a used vehicle. Is it necessary to protect it against rust? Yes, as soon as possible. Even if your vehicle is a little rusty, our rust proofing treatment will greatly slow down the progression of existing rust. Is Metropolitan’s rustproofing treatment guaranteed? Yes, garantees free of charge are available for new and used vehicles. The warranty for used vehicles is available only if your vehicle is in good condition, with less than three years of age and less than 60 000 km. One of our experts will need to inspect your vehicle before granting the guarantee. Can the rustproofing treatment remove existing rust? Our rustproofing product can not remove existing rust, but it may slow its progression and prevent new rust from forming. What is the rustproofing process? Voir la section «Our treatment». Why do you drill holes and can they rust? See «Drilling» section in our website. How long does it take for the application of the rust proofing treatment? It generally takes between 35 to 45 minutes. In times of high production, product application time can be reduced by the number of employees working simultaneously on your vehicle. During winter, it takes approximately an hour to allow us to de-ice and dry your vehicle. Do I drive on sandy roads after getting my car rustproofed? No, avoid sandy roads for at least 24 to 48 hours. Earth, sand and dust will create a crust in certain areas and absorb the product, which will reduce efficiency. Is your rustproofing treatment compatible with my hybrid or electric vehicle? Yes, we protect many electric and hybrid vehicles annually against rust. There is no contraindication against rust regarding our product with these types of vehicles. My vehicle is freshly painted or had a few paint touch-ups, should I wait before my rust proofing treatment? Yes, if there is fresh paint on your vehicle, you must wait at least a week before proceeding to your rust proofing treatment. What is the best time to protect my vehicle against rust? Anytime. The treatment is effective for one year. Can I protect my vehicle against rust during the winter time? Yes. We first proceed to a high pressure rinse to de-ice your vehicle. We then dry your vehicle with large industrial dryers. It is important to dry your vehicle to facilitate the infiltration of our rust proofing product. Can I get my car rustproofed during rainy days? Yes. Large industrial dryers allow us to completely dry your vehicle. It is important to dry your vehicle to facilitate the infiltration of our rustproofing product. Can rain remove your rustproofing product? No. Our rustproofing product is strongly bound to the metal and does not mix with water. Thus, it creates a screen to water and moisture. Just try to wash your hands dirty oil with water, it does not leave, even rubbing, you need soap. Will my vehicle be washed after applying the rust? Yes, your vehicle will be completely washed by hand. How long should I wait before washing my car? You can wash your car whenever you want. Do I have to wash my vehicle before my appointment? It is not necessary. On the other hand, it is advisable to clean the underside and fenders of your vehicle, if it is unusually dirty (thick layer of mud, etc.). Can a car wash compromise my rust protection? No. You can wash your car in a car wash at any time.